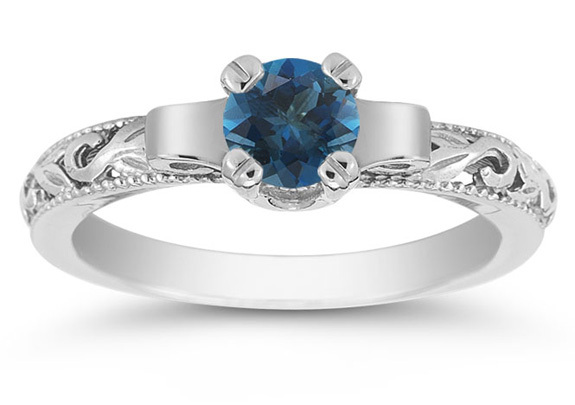 The dark, intense color of a london blue topaz gemstone is featured in this ring from Apples of Gold. The 5mm london blue topaz gem is mounted high in white gold, giving the stone a perfect place for you to admire its deep blue color. The band is also crafted of white gold and takes on the appeal of art deco with finely crafted scrollwork that begs to be displayed. Two milgrain edges finish this captivating art deco design. We guarantee our Art Deco London Blue Topaz Engagement Ring, 14K White Gold to be high quality, authentic jewelry, as described above.